When I wrote about the last minute dress in August, I had hoped to post a picture soon of me actually wearing the dress. Here it is. Some of the things I like about this knit dress -- simple to cut, easy to sew. No darts. It's so stretchy and comfortable to wear. I liked using a French binding as an edge finish on this particular dress. 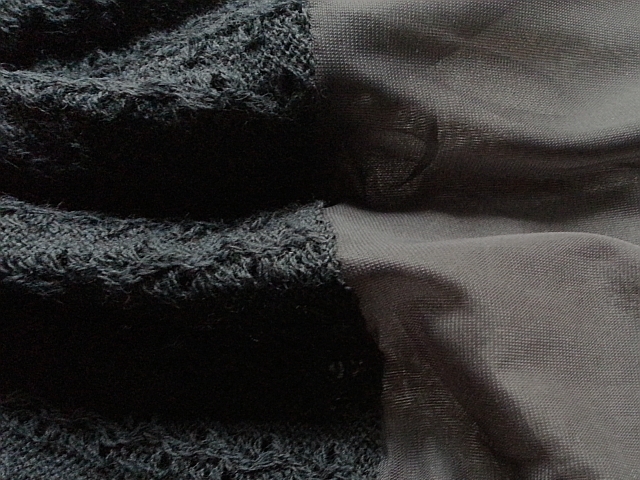 There was no need to cut the binding fabric on the bias, since it was already stretchy. 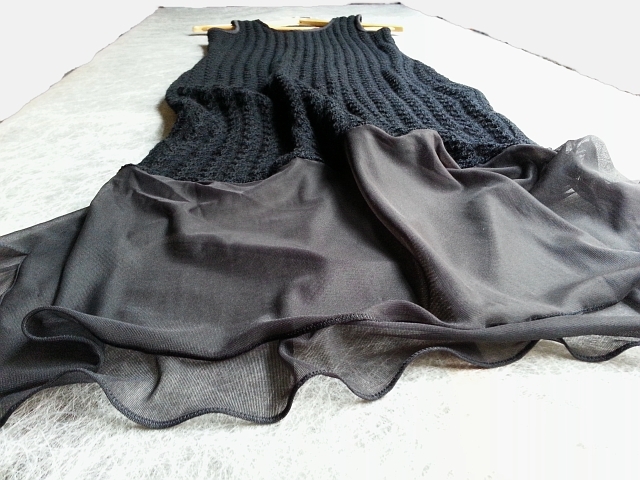 Sewing the sweater knit to a sheer fabric was pretty straight forward. I'd never done a rolled hem on this machine, however. I'm glad to report that it was easy to learn on the sheer nylon knit fabric. 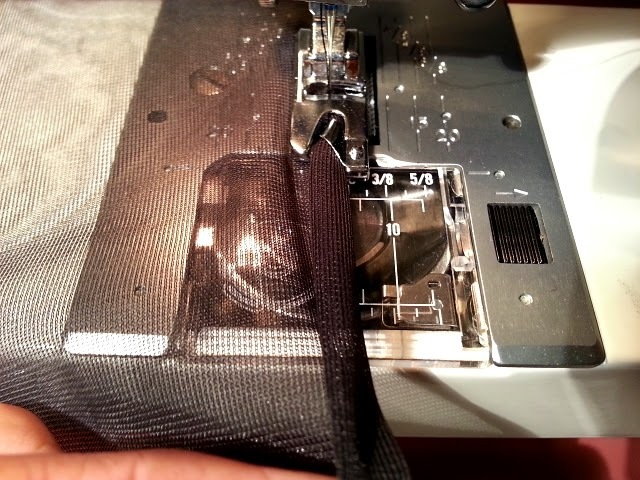 Following the directions in the manual for using the rolled hem foot (Janome foot D), I tested stitch size on a scrap. It had a slight lettuce edge (which I liked), but it seemed as if the thread would break, if the edge were stretched more. I decided to try again with a zigzag setting (2 mm wide by 1 mm long) this time, since the slot in the foot seemed wide enough to accommodate a zigzag. Honestly, I probably didn't need to zigzag, but I liked the look more on this fabric for some reason. I assume that easing the pressure on the presser foot one more notch would have eliminated the minor ruffling, but I decided to keep it around. By the way, I think rolled hem feet are magic. 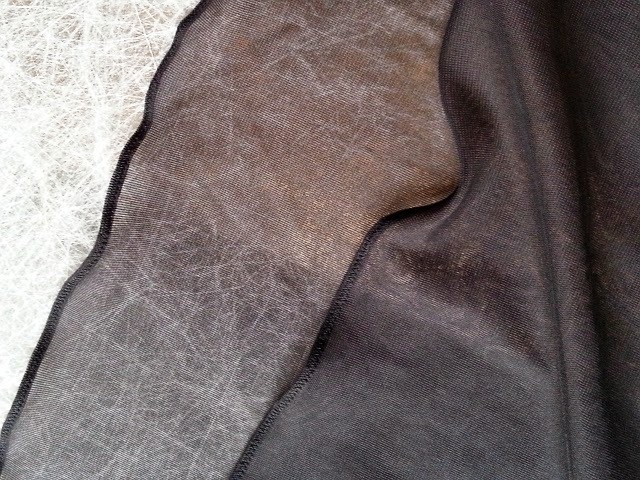 And yes, I will now attempt to show black thread on black fabric. There'll be another, perhaps not-so-last-minute, fancy sweater knit dress in my future. I love it! So glad you posted a photo of you modeling it! The sheer panel is so fun with the knit. I really love this dress and it looks so stunning on you! Jacquie, that means so much coming from such a creative individual as yourself. Thank you. Wow - this is so beautiful! And it looks fabulous on you. Thanks so much, Chuleenan! It feels good to come across a quick and easy project that works out.